Domiciled for Christmas festivities, no sooner had the turkey digested The Wandering Palate was in peripatetic mode, Melbourne bound and yearning for a food fix. Alas, we forgot about the great Australian shutdown with practically every decent restaurant in Melbourne closed for an extended holiday over Christmas and New Year. It’s like Paris in August, the place is deserted. Well, that’s not exactly the case. Yes, all of the chefs and restaurateurs have gone AWOL whilst the hordes of tourists and locals are left to fend for themselves. And I was about to say Melbourne is a true metropolis; a megacity that never sleeps. However, that big country town and languorous underbelly is still there, even if the place seems to be bursting its urbanized seams. Even worse, bordering on tragedy, my wife’s hairdresser is away, sunning himself in Byron Bay. She is almost paralyzed by his absconding and the notion of suffering another bad hairdo. There is a gastronomic glimmer of hope, discovering that Hellenic Republic www.hellenicrepublic.com.au, the best Greek food in town, is in fact open. Problem is their wine list is somewhat Greek, which won’t quite fit with our dinner guests, Philip Jones, proprietor and lauded vigneron from Bass Phillip and our Wandering Palate Australian correspondent, Andrew Jenkins. Now craving what is arguably the best Souvlaki outside of Greece, no surprise given Melbourne is the second largest Greek city outside of Athens, moreover Chef George Calombaris www.georgecalombaris.com.au celebrated in both countries, we decide to order takeaway deconstructed Souvlaki; that is Arni sto fourno – slow roasted shoulder of lamb, Kotopoulo psistaria – Bannockburn free range chicken, Tiganites patates – potatoes fried in olive oil, oregano, salt, Tzatziki – cucumber, dill, garlic, olive oil and yoghurt and of course, Pita Bread to which we reassembled ourselves at the table and was nothing short of outstanding even if simple fare that Homer would have been proud. Jones treated us to a bottle of 1993 Bass Phillip Premium Pinot Noir, the product of a very difficult vintage and one that has not been spoken of, if not disappeared from the radar screen. The wine is brilliant, actually its extraordinary and completely un-Australian; that is there’s no way you would pick as an Australian pinot noir rather it most definitely looked like a fine ‘Grand Cru’ Burgundy. Actually it reminds me of a Musigny with an exuberance of sweet and sour red cherry and violets, infused with mineral and smoky dried meats and earthy, pongy animal nuances. What’s more the wine still has many years ahead of it, in fact a decade I would have thought; an enigma for Australian pinot noir. If only this winery was the hallmark of Australia on the international wine stage instead of the brawny, uncouth, commercial concoctions that have done so much harm to palate and reputation. 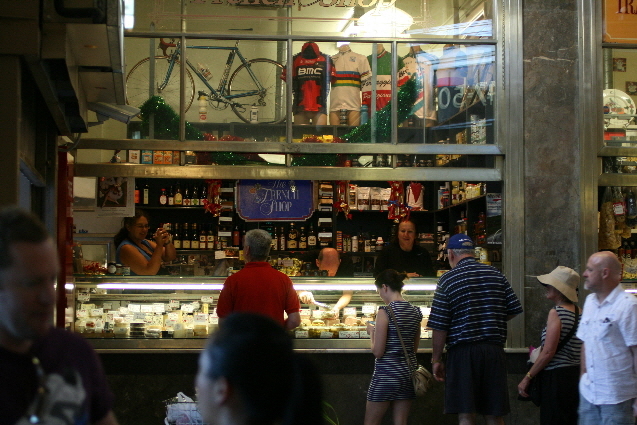 The following day we were off to market, the South Melbourne market to be precise as the Queen Victoria market is closed on a Wednesday. 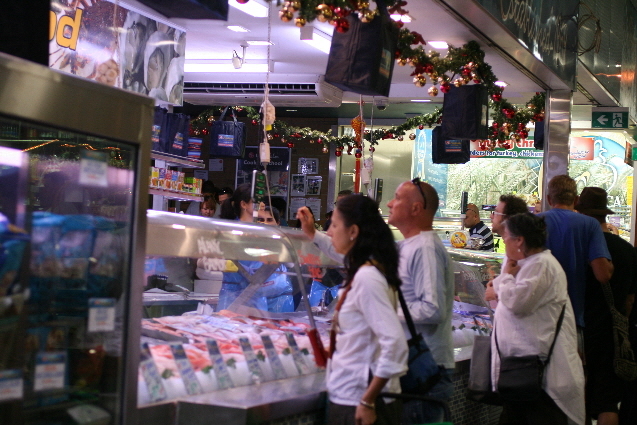 Whilst smaller and less frantic than QV there is still a good number of fresh produce stalls and with the temperature climbing to low thirties (Celsius) seafood is looking like a good menu. We are also craving a spaghetti marinara and seen that Bacash is closed, the venue of the world’s best spaghetti marinara, we shall have to make do with our own adaption. And hold that impertinence and insinuations of plebeian palates; there is nothing better than a selection of the very freshest Fruits de Mer you can procure served with Al Dente pasta; and please DO NOT buy marinara mix because that is plebeian. Surveying the fishmonger stalls, glassy, milky white calamari captured the senses immediately; this would be substance of the dish, flame grilled whole and sliced just before serving. Rock flathead tails looked particularly enticing as one rarely sees this fish outside of Australia; a brilliantly sweet firm white fleshed fish prevalent on the Victoria coast. Even more tantalizing are plump scallops from Port Phillip Bay resplendent with their bright orange-jelly-looking rows. It baffles me to see the row cut off scallops, or what you invariably see in Asia as Chinese Scallops, all white and perfectly rounded as if stamped out by machine. I snapped up the large wild prawns from the Queensland Coast looking more like small crayfish, a rare treat in these days of largely farmed prawns and they too will be all the better after encountering our Garland grill. And the most important ingredient of all, freshly shucked Tasmanian oysters, about as cooler waters as one can find in the Australian summer. Both sea salt and oysters must only be added at the very end to the hot pasta so they only gently steam; a delicate mid-point between fresh and poached. When cooking spaghetti marinara, it is imperative to have all your ducks in a row; your seafood all prepared, your pans all ready and if you have a grill, or the trusty BBQ, make sure all is sufficiently fired up. Spaghetti needs to be perfectly timed to be drained and tossed immediately with the seafood. You should also have a good-sized handful of finely chopped parsley as this is a key flavour lifter and garnish; looks very professional. Calamari and prawns can be cooked first, at the same time pan-frying your fish fillets. Cook scallops at the very last minute, and slightly undercook everything as it will continue to cook once mixed with the pasta and heading for the table. The secret ingredient: deglaze your pan used for fish or scallops with loads of chopped garlic and a very high quality Sherry vinegar, which will not only lift the seafood but add a most agreeable salty, tangy – almost balsamic-type sweet-sour nuance – adding this to your seafood and hot pasta gently rolled around in large white serving bowl. Do not plate up individually, looses the Ooh Ah effect. And why am I going to such great length to describe such a rudimentary dish; well because even the most abecedarian cook will impress the hell out of guests serving this wonderful one-pot eidos of the sea. The digression of our Australian festive season holiday to self-help, self-cook is obviously in line with the deserted state of Melbourne city; even the Lego Centre was closed during the days between Christmas and New Year, an angry children’s ‘Spring’ rallying outside the doors when we visited. Thinking on our stomach, we invited ourselves to lunch the next day with vignerons friends in the country, high in the hills of the Yarra Valley, a beautiful breeze on perfectly warm, sunny day, the cold pea soup and Gembrook Hill Sauvignon Blanc consummate. More on Australia’s best winery later… have to run, before Ocker Neurosis sets in.